Rose Quartz is a member of the Quartz family. It usually occurs in massive form but sometimes grows in clusters of small prismatic crystals. Its name is derived from its colour, which ranges from very pale pink to deep reddish pink. Its clarity can range from opaque to translucent to transparent, although most transparent pieces are rather foggy. In some specimens, traces of Rutile within the stone cause six-rayed stars in cabochons or spheres. This is known as asterism. The colour of rose quartz is due to a number of different minor impurities present in the rose quartz including titanium, manganese and even colloidal gold. 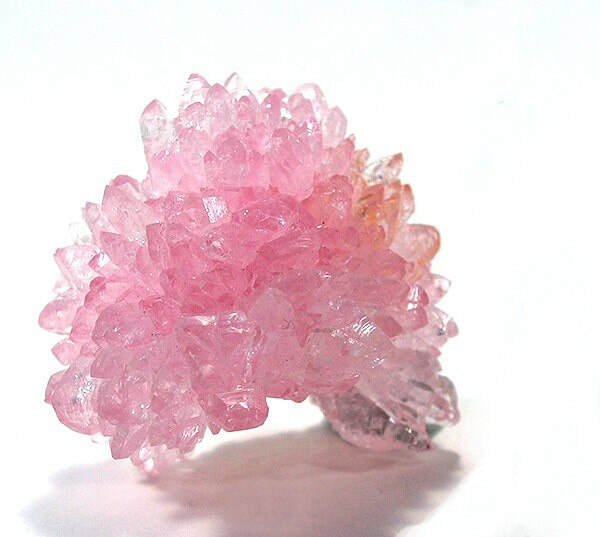 ​Rose Quartz is found in Brazil and Madagascar, as well as South Dakota in the USA. Rose quartz supports skin regeneration and skin rejuvenation. It can also help during a cancer related healing process. Use this stone as a sleep aid and for healing the physical heart and any diseases or challenges associated with the heart. 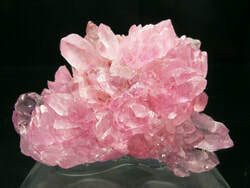 Rose quartz stimulates the blood circulation in the tissues. It fortifies the heart and sexual organs, helps with sexual problems and encourages fertility. Rose Quartz is a gentle stabilising stone to use for physical heart trauma and imbalance. It can help the heart make the shift from stress-based physiology to the higher frequencies of Love-based physiology. It is ideal for premature babies and young children with heart weakness or disease but can be used by anyone who needs a stronger, more stable heart. ​Rose quartz repairs and strengthens the heart and circulatory systems. It releases impurities from the body. It helps chest and lung problems. Heals the kidneys and adrenal glands. Rose quartz will balance the inner ear to reduce vertigo. It will increase fertility. Bathing with crystal water will reduce and sooth burns, blistering and smooths the complexion. It is helpful for Alzheimer, Parkinson and senile dementia patients. Rose quartz is the perfect stone to help you attract romance and love into your life. It assists in attracting your soul mate. The soothing pink colour of rose quartz is perfect for situations when you need to feel comforted and surrounded by unconditional love. Use it when you need to amplify your own feelings of unconditional love for others. It is a good stone for grief, loss of love, loss of friendships and to make a better connection with babies and children. 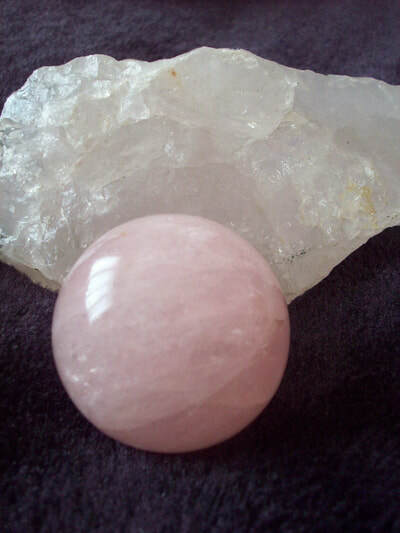 Rose quartz imparts empathy, sensitivity and sometimes over sensitiveness. It encourages proper self love, a strong heart, romance and the ability to love. Rose Quartz is calming for the mind, assisting you in releasing worry, fear, anxiety and past emotional trauma. It clears the emotional body of ego-driven patterns and can help one feel more open to receiving and sharing Love, compassion and kindness. Rose quartz releases unexpressed emotions and heartache. It soothes internal pain and heals deprivation. If you have never received love, rose quartz opens your heart so that you become receptive. If you have lost love it will comfort you in your grief. Rose quartz teaches you how to love yourself, particularly if you feel that no-one loves you. You can't receive love into your life until you learn how to love yourself and rose quartz is ideal to teach you this important fact. Rose quartz encourages you to trust, value, accept and forgive yourself. Rose quartz adds the element of love to the thoughts you hold in your consciousness With this stone in hand, practice thinking through your heart. Put your attention and focus on your heart when you try to think things through, and you will find a peaceful loving solution to whatever you are contemplating. 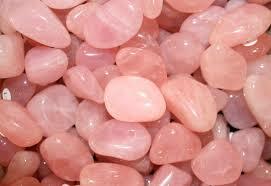 Rose quartz liberates you from worry and helps you discriminate between sympathy and antipathy. Rose quartz draws attention to the fulfilment of elementary needs. Rose Quartz can stimulate the crown chakra, third eye and throat chakra, bringing them into harmony and unity with the heart. Even the lower chakras respond favourably to the abundance of love energy which flows from the heart under the influence of rose quartz. This stone is ideal to give to anyone, even strangers. As a talisman of love, rose quartz can spread compassion and gentle understanding throughout the world. When you gift a lover, a friend, a stranger or a child with a rose quartz, there is an unspoken appreciation that reverberates through the Universe, as one more boundary is softened or dissolved. Rose quartz draws off negative energy and replaces it with loving vibrations. It strengthens empathy, sensitivity and will help you accept the necessity for change. It is an excellent stone for anyone going through a mid-life crisis. 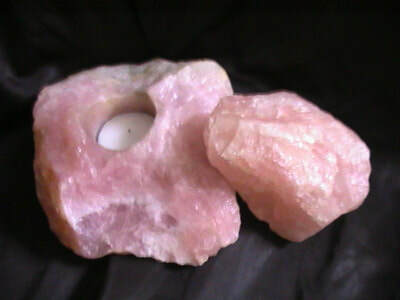 Hold rose quartz when participating in creative visualisation and affirmations. This stone will remind you of your long term intentions. 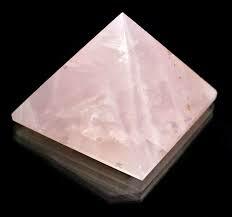 The pink vibration of rose quartz activates the bridge between the upper three chakras and the lower three. This significant because this bridge helps connect your human existence as a grounded individual on this planet with your spiritual one. This stone aligns your consciousness with Divine love, compassion, mercy, tolerance and kindness. It calls the energy of the angels to surround and protect you. Rose quartz encourages you to be gentle but firm. There is no question of pliability or giving in, rather there is an awareness of the gentle soft nature overcoming the, hard strong one. 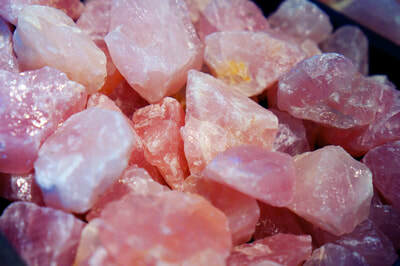 Rose quartz encourages helpfulness, openness and the desire for pleasant ambience. Rose Quartz is one of the most humble, yet most powerful of the spiritual allies. It turns the heart toward love and bathes body, mind and spirit in that healing and enlightening frequency. It carries the loving consciousness of the Christ and other heart centred spiritual masters.